The eave overhang gives some protection to the side wall and connects the roof and wall. Soffits are usually closed in with pre-finished metal or vinyl panels or 1/4 in. (6 mm) sanded plywood nailed at 6 in. (150 mm) on centre along the edges and 12 in. (300 mm) at intermediate supports. The exterior finish is then butted up to the underside of the soffit. A fascia board added as a finished covering for the rafter header usually extends about 1/2 in. (12 mm) below the soffit covering to form a drip edge. The three general types of eave construction are shown in Figure 92. 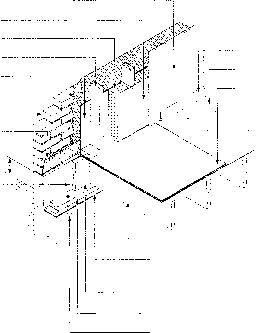 A narrow eave projection (Fig. 92A) is sometimes used on roofs with a steep slope. Here the rafters are projected a short distance over the wall plate, and the ends are cut to suit the angle required for the rafter header and soffit covering. The soffit covering is nailed to the angled surface of the rafter. Where the soffit covering is less than 5 Uz in. (140 mm) wide, a 1 in. (19 mm) board is generally used for this purpose, because the board does not require support along its edges. When wider eave projections are used with a horizontal soffit, blocking is installed to support the soffit covering (Fig. 92B). A 1 in. thick (19 mm) nailing strip is placed on top of the sheathing along the wall and nailed to the framing. This strip supports the inner ends of the blocking and edges of the soffit covering. The blocking, which may consist of 2 x 2 in. (38 x 38 mm) material, is usually spaced at 24 in. (600 mm) on centre. It is toenailed to the nailing strip and end-nailed to the rafter header. The soffit covering and fascia board are then nailed in place. Roof projection at eaves: (A) narrow eave projection; (B) wide eave projection with horizontal soffit; (C) wide eave projection with sloped soffit. Eave and gable-end intersections: (A) eave soffit is terminated at the wall line and gable-end soffit is continued to the fascia board at the eave; (B) eave soffit is sloped on same plane as gable-end soffit; (C) eave soffit carried out to the rake rafter and gable-end soffit is returned down to meet the eave soffit; (D) soffit and fascia detail using aluminum. nailing strip placed along the wall over the sheathing. This type of support is usually confined to overhangs of not more than 4 ft. (1.2 m). Sloped soffits which follow the line of the projected rafter (Fig. 92C) are sometimes used instead of horizontal soffits. In this case, the soffit covering is nailed to the underside of the rafter. The outer edge of the soffit covering is nailed to the rafter header and the inner edge to 2 x 2 in. (38 x 38 mm) blocking placed between the rafters. 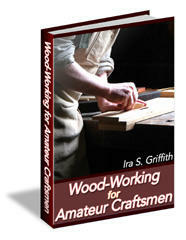 THIS book is one of the series of Handbooks on industrial subjects being published by the Popular Mechanics Company. Like Popular Mechanics Magazine, and like the other books in this series, it is written so you can understand it. The purpose of Popular Mechanics Handbooks is to supply a growing demand for high-class, up-to-date and accurate text-books, suitable for home study as well as for class use, on all mechanical subjects. The textand illustrations, in each instance, have been prepared expressly for this series by well known experts, and revised by the editor of Popular Mechanics. How many millimeters is eave projection in buildings?